The Pacific Rim deal was intended by the Obama administration as a way to counter China's influence, but Trump pulled the United States out of the pact in early 2017. WASHINGTON — President Trump told top administration officials Thursday to look at rejoining the Trans-Pacific Partnership, a major shift on the sprawling multination trade pact that he rejected just days after taking office. Rejoining the pact would come as Trump escalates a trade conflict with China. The Pacific Rim trade deal was intended by the Obama administration as a way to counter China’s influence, but Trump criticized the pact as a candidate and pulled the United States out of it in one of his earliest moves as president. Trump gave the new orders to U.S. Trade Representative Robert Lighthizer and National Economic Council Director Larry Kudlow during a meeting Thursday with lawmakers and governors in the White House Cabinet Room, said several Republican senators in attendance. Sen. Ben Sasse, R-Neb., also witnessed and applauded Trump’s surprise move. In the past, Trump has repeatedly floated major policy proposals in meetings and then quickly abandoned them. It remains to be seen if his comments Thursday represent plans to seriously explore rejoining TPP, and some free-trade supporters approached his remarks with skepticism. “If it holds until this afternoon, that’s a good move,” remarked Sen. Jeff Flake, R-Ariz., a free-trade advocate and frequent Trump critic who was not at the White House meeting. Trump’s opposition to multination trade pacts like TPP and the North American Free Trade Agreement was a central part of his campaign for president in 2016 and accounted for some of his appeal to working-class voters. He argued that the deals were terribly negotiated, ripped off the U.S. and hurt American workers and manufacturing. 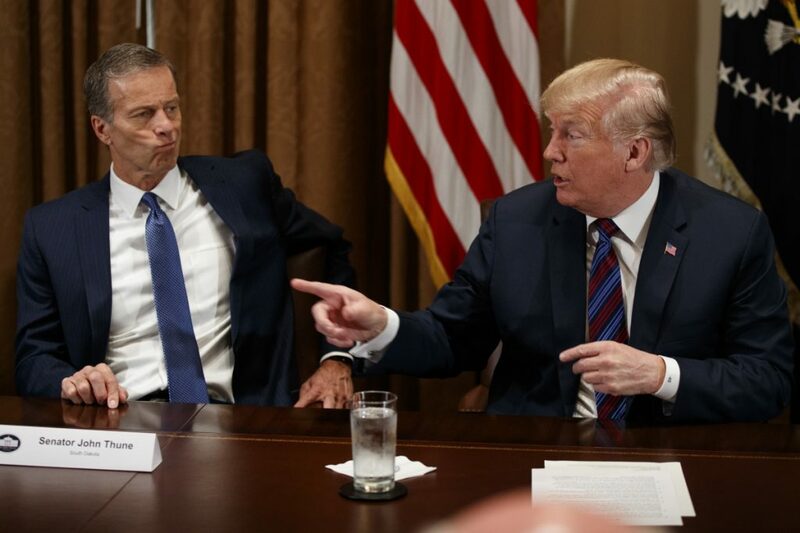 The president’s protectionist impulses on trade since taking office have caused intense heartburn for many Republican lawmakers who continue to embrace the Republican Party’s traditional support for free trade. If the president does move forward with rejoining TPP, business groups and many Republican lawmakers would be sure to applaud the move, even though it would stand as the latest example of Trump going back on a campaign promise. At least some labor groups were alarmed at Trump’s willingness to restart the TPP process. A number of them have argued that these trade deals make it easier for companies to move jobs overseas, hurting American workers by depressing wages and closing factories. Trump administration officials are also working to renegotiate NAFTA, and the president told senators Thursday they were making progress. NATIONS RATIFIED TPP WITHOUT U.S. Engaging in talks to re-enter the TPP would be part of a broader White House strategy to respond to an escalating trade flap between Trump and Beijing. Trump is looking for ways to crack down on what he believes are unfair trade practices by China, but he is having a hard time rallying other countries to backstop his push to impose new tariffs or raise the costs of exports and imports for China. The president is also running into strong pushback from Republican lawmakers, particularly those representing agricultural regions that would be hit hard if China follows through on its threatened retaliation against U.S. exports. The TPP is a trade agreement that the United States, Canada, Mexico, Japan, Vietnam, Singapore, Australia and a number of other countries signed in early 2016, aiming to strengthen economic ties among their nations and give them more leverage in dealing with China. The agreement never went into effect, however, because Trump withdrew from it three days after he was sworn in. The remaining countries still ratified a version of the TPP without the United States earlier this year. The president first raised the prospect of re-entering the trade deal at the World Economic Forum in late January. He said then that he would rethink his opposition if the U.S. secured “substantially better terms,” without offering specifics. One question is which TPP Trump wants to rejoin: the original 12-nation deal that the Obama administration negotiated, or the 11-nation agreement that is now moving toward implementation by the remaining countries. When the president last year announced he was quitting the deal, the other TPP countries suspended 20 provisions in the original accord and announced a new deal, the Comprehensive and Progressive Agreement for Trans-Pacific Partnership, or CPTPP. The provisions, including key intellectual property protections such as those involving biological drugs, were measures the U.S. had demanded in return for granting access to its market. U.S. negotiating partners might expect the U.S. to “pay for” restoring those provisions at this point, Cutler said. The U.S. also might seek to revive the 12-nation deal, which would take effect if the U.S., Japan and four other signatories formally approved it. Or, the administration could seek to negotiate a new agreement, Cutler said. Trump was not the only one to oppose TPP during the 2016 presidential campaign. His Democratic rival, Hillary Clinton, came out against the deal as she faced pressure during her primary campaign against Sen. Bernie Sanders, I-Vt., who was outspoken against TPP. Clinton had played a role in its formation during her time as President Barack Obama’s secretary of state. Even before Trump’s election, the Trans-Pacific Partnership began to founder and stall in Congress as it got caught up in political cross-currents, losing support from some Republicans and progressive Democrats. In May 2016, as domestic political backing for TPP was starting to erode, Obama wrote an op-ed in The Washington Post aiming to rally support. Entering into a new TPP could unify Trump with other trading partners and put new pressure on Beijing to either allow more imports into China or risk being alienated by other Asian countries that would now receive new trade benefits as part of the deal. Senate Republicans have long been pressuring the administration to re-engage with the Pacific Rim nations. Sen. Steve Daines, R-Mont., and two dozen other Republicans wrote to Trump in February, urging him to rejoin the agreement – a letter Daines referenced during Thursday’s meeting. The TPP is becoming one of the White House’s few remaining options as Trump searches for ways to exert pressure on China to back down from its threat of new tariffs on U.S. exports. American farm groups have said they fear getting caught in the middle of the trade spat that Trump and Beijing have recently escalated, and they want assurances that they will not lose out on foreign buyers. The White House had been looking at using a Depression-era program known as the Commodity Credit Corporation that could be used to extend subsidies to farmers, but Republican lawmakers pushed back hard on that idea during Thursday’s meeting. “The president was surprised by that. He’s like, ‘Really?’ He said, ‘Oh, really? OK, so we won’t do that,’ ” Daines said.